Many years ago I had a conversation with an older colleague whom I admired very much. He was an accomplished scholar of the New Testament and especially of St. Paul’s epistles. We were discussing the teaching on the Church in the New Testament when he made a statement that took me back. “According to such-and-such a scholar,” he said, “every instance of the word ecclesia (church) in the New Testament refers to the local church.” I was astounded at this claim because I knew what he and this other scholar meant by that. For them, the local church was the individual congregation whether it had any institutional connection with other churches or not. They were claiming that there is no justification in the Bible for a church beyond the local congregation (parish). Let’s face it. Everyone has preconceptions of the Church when they read the Bible and they think they find support for their thoughts in the New Testament. How can we truly discern the meaning of the Church in the Bible without prejudging its teaching? How can we subject our ideas of the Church to the New Testament in hopes of arriving at its own teaching without imposing our ideas on it? Can we see clearly in the Bible that the Church is necessary? Perhaps an analogy will help. If you get cold symptoms, you may have a number of things such as bronchitis or influenza. If you go to the doctor, he or she will have to tell whether your symptoms are a result of a bacteria or a virus. If your condition results from a bacterial infection, he or she can prescribe antibiotics to heal the infection. If it is a virus, the doctor can do nothing. Your body has to fight it off. The medicine prescribed corresponds to the nature of the sickness you have. In a similar way, the necessity of the Church of Jesus Christ corresponds to the nature of the Church. If we can truly discern the nature of the Church, we will have an answer to its necessity. No writer in the New Testament has a richer teaching on the Church than St. Paul and perhaps none of his letters is so rich in content as Ephesians. The perspective of this letter is unique in its looking at the Church from the point of view of heaven. This is why Paul says that God “made us alive with Christ when we were dead in transgressions … and he raised us up and seated us with Christ in the heavenly realms in Christ Jesus” (Eph 2:5,6). Accomplishing salvation in the Paschal Mystery, Christ intended the Church even as he died and rose again. But Jesus did not think of the Church first when he was on earth. Paul assures us that the Church in its mystical reality was planned by God from before the creation. When Paul speaks of God the Father “predestining us for adoption as sons through Jesus Christ for himself” (Eph 1:5), he is showing us that God foresaw the Church as the community of all the redeemed who would be in Christ. There are many treasures hidden in the bosom of the Church given by Christ Jesus himself. When Paul speaks of us as “God’s poem” in Eph 2:10, he alludes to baptism as the sacrament of the new creation, “For we are God’s poem (poiema means craft, verbally or manually), created in Christ Jesus for good works for whom God prepared them beforehand that we might walk in them.” This idea of baptism as the new creation (cf. 2 Cor 5:17) comes from Jesus himself who stressed to Nicodemus the absolute necessary of having the grace that comes through baptism (see Jn 3:3,5). This is the same grace that Paul declares is our salvation in Ephesians 2:8, “for it is by grace that you have been saved through faith.” So the treasures of grace, without which we cannot be saved, come to us through the sacramental ministry of the Church. That is why the Church is a necessity on this earth. The second treasure of the Church is its catholicity. Paul teaches that the Church was planned in eternity and established on earth as the communion (and community) of all peoples in and through Christ. The great privilege of gentile Christians is “we too have been brought near in the blood of Christ” (Eph 2:13). Even though we were “alienated from the commonwealth of Israel” and “strangers to the covenants of promise” and in fact “with hope and God in this world” (Eph 2:12), Jesus’s death on the cross “abolished the dividing wall” between Jew and Gentile. His flesh “destroyed the enmity” (Eph 2:14). The result was that he “created one new man by making peace.” The new man he created is not simply the individual, though our individualistic perspective may be tempted to read it this way. No, the “new man” is the Church which consists of both Jew and Gentile. This is why Paul says elsewhere that in Christ there is not “Jew or Greek, slave or free, male or female” (Gal 3:28). In this new creation of the Church there is “no Greek or Jew, circumcision or uncircumcision, barbarian, Sycthian, slave or free because Christ is all and in all” (Col 3:11). The reason the Church possesses catholicity is that Christ intended his salvation for all the world. No one is excluded from his redeeming work and therefore the Church is given as necessary to proclaim and transmit His saving work. The third treasure of the Church is its ordered life. Many modern Christians see no real necessity for the structure of the Church but Paul in Ephesians thinks otherwise. The way in which the Church lives out its unity is through its structure. When Paul urges on us the pursuit of unity in Ephesians 4:1-3, he explains our call to unity on the grounds that Christ establishes that unity through the gifts he gave to the Church (see Eph 4:5-8). Those gifts or charisms are the offices he established in the Church. The “apostles, prophets, evangelists, pastors, and teachers” (Eph 4:11) are given for the unity of the body. The diversity of gifts serves the purpose of unity in the Church. The ordered structure of the Church is necessary for the unity of the Church. The Church is necessary because of what Christ made it to be. Grace is necessary to be saved, and so he made the Church an instrument (or sacrament) of grace. Catholicity of the Church is necessary because Christ wanted all men to come to the knowledge of the truth and so to be saved. Ordered structure and hierarchy is necessary so that the Church would achieve the status Christ desires for it, that of the “perfect man” (Eph 4:13). There was an ancient maxim expressed by Cyprian of Carthage that runs extra ecclesiam nulla salus (“outside the Church there is no salvation”). This idea was so widely believed among ancient Christians that the early Protestant Reformers also felt an obligation to embrace it. But these teachings about the Church held by the Fathers were rooted in the witness of the New Testament itself. I believe that a careful study of the doctrine of the Church in the New Testament would lead any honest Christian to realize that the Church is necessary for salvation. Kenneth J. Howell taught for thirty years in various colleges and universities before taking his present position as Resident Theologian of the Coming Home Network. 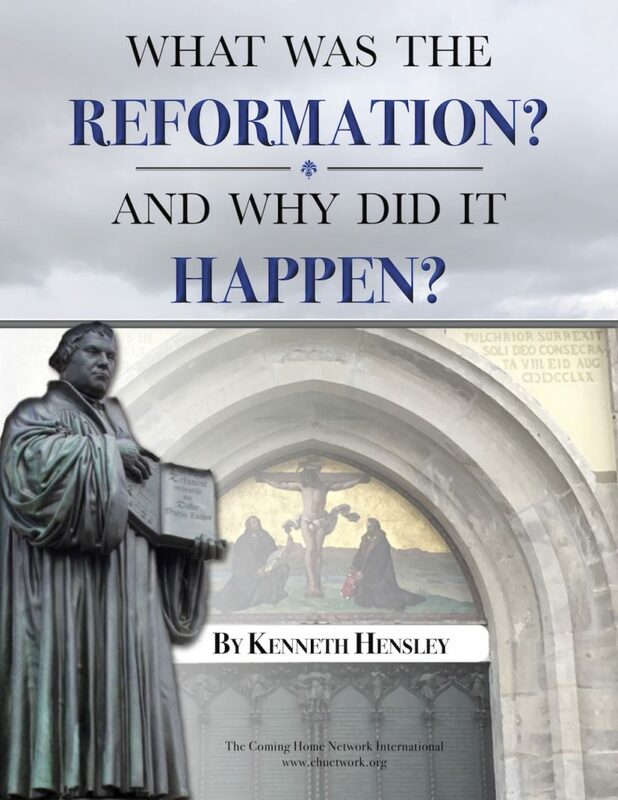 He has published seven books including two on the early Church Fathers. For more information about Dr. Kenneth J. Howell click here. You may also read his conversion story by clicking here.